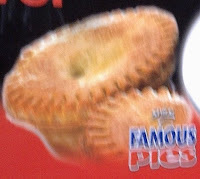 Pierate - Pie Reviews: Shire Famous Pies – Are they the Lord of the Rings? Shire Famous Pies – Are they the Lord of the Rings? The first great move from Walsall FC was to have real strength in depth in their pie line up, with the star players steak and kidney and chicken and mushroom alongside an overseas acquisition in the form of the chicken korma pie and the vege friendly potato and leak pie. The colour was your standard golden brown, and the condition of the top lid was nice and firm despite having been put in a heating bag which could easily have over-soggified the pie. 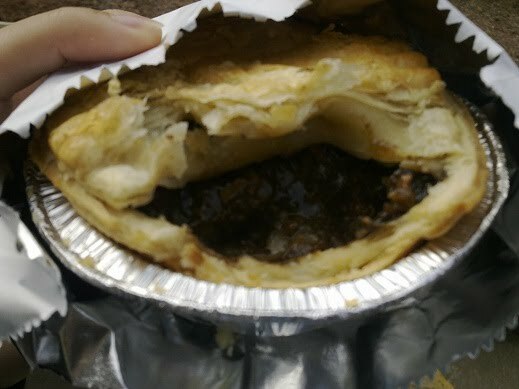 A quick run down the pitch from the pie stall past the queue and into his seat ensured the pie was eaten in tip top condition, with no sign of fatigue early in the second half. The capacity was surprisingly good in terms of being filled to the brim with gravy and chewiness was limited due to the large amounts of gravy and smaller chunks of steak and kidney. While this led to a good lack of chewiness, it did leave a big hole in the content’s meaty defence, which would clearly be punished by an experienced Pierateer like yours truly. The consistency was clearly skewed towards the gravy side, but there was just about enough meat to enjoy the pie. However they should definitely invest in their team before the start of next season, and hopefully the break in play will allow them to review their tactics and make an important signing of more meat. While the cost didn’t send me into administration, the lack of meat should mean points deducted from the lads for the price being charged. Hopefully they will re-climb the table once they invest in the summer transfer market. All in all, the pie was nice but lacking in the meat department. As the meat is the driving force at the heart of the pie’s midfield, it certainly could do with a super sub during the transfer window. 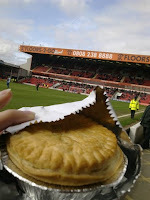 But as for half time satisfaction, nothing beats a good old fashioned pie at the footie! Bilbo Baggins would certainly give a cheeky thumbs up to Shire Famous Pies. Do Peter’s put the passion into pie making? Pie and Mash or Pie and Chips? !